Do you want to decorate your living room decor in a beige theme? Here are ten creative ideas for a beige living room that will inspire you. Updated for 2019. The color beige is an earthy color that brings warmth to the room design but in a neutral manner. It doesn’t pop, and it doesn’t clash with other colors. However, it plays with the hues of blue best. 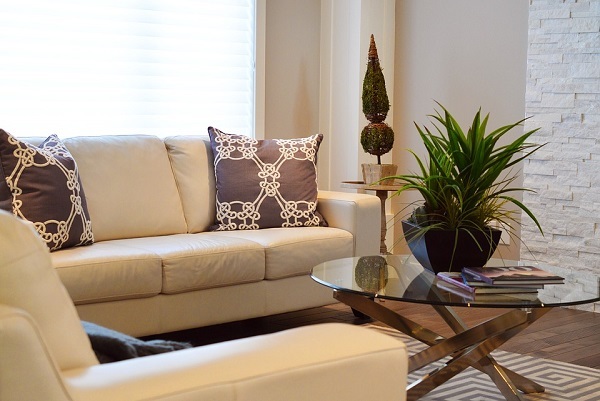 One caveat in beige living rooms is finding the correct accents and avoiding a flat design. To help you with decorating a beige living room, we have picked ten great design ideas. They will show you how you can use different decor techniques to make a beige themed room visually appealing. So check them out and take some notes for inspiration. Patterns play a significant role in home decor, and it’s particularly evident in this beige living room. The beige furniture and room walls would not provide enough decor interest alone. But the accent rug and pillows add that necessary touch. The accent exposed brick wall helps to increase visual appeal too. In this room, the furniture and the area rug create the beige theme against a white wall background. But the real accent that makes an otherwise dull decor interesting is the black chairs and side table. This has an effect of moving the sightline across the room and expanding visual space. Beige and blue tones work together really well, and it’s evident in this living room design in particular. We can see two clear lines that divide space horizontally. First, the upper beige line (the walls, the picture frames, the mantel) sets the background tone. Next, the lower blue visual line (the furniture, bookshelf backdrops, accent art) brings the place together. Together, this contrast creates much decor interest and even drama. Who says rattan furniture is only for the patio? We certainly don’t. And this beige living room is the example of that. The sofa and armchairs work so well in this decor. We can see a warm and cozy country-style decor thriving in this interior design. Modern design makes excellent use of beige color theme in this living room. The designer has used oversized wall art (also in beige colors) to add visual interest to this room. The statement coffee table and an oversized gilded vase make an excellent focal point. Beige means warmth in traditional room design. And it’s evident in this living room. The furniture and the area rug set the tone together. Meanwhile, the decor builds the character with antique items and layered mood lighting. Luxury design can take a lot from a beige theme. The earthy tones make the place a lot more welcoming. Meanwhile, luxe is being carried over with marble floor and antique statement furniture. Another accent color that contrasts with beige well is teal. It’s evident in this living room as the beige furniture is juxtaposed with the teal accent wall. The room decor is brought together with the clever use of wall art and accent cabinets and shelves. Beige accents can be used in a beige living room too. The solution to making it visually appealing is choosing vibrant hues. Check out how the accent pillows stand out in this living room design. The statement chandelier and coffee table in art deco style help too. Rustic living room decor benefits significantly from a beige theme. The former accents go well with beige, and it’s evident in this room decor. And it’s all thanks to the earthy nature of the color beige.